Home » The Law & You » My Daughter is Being Bullied. What Can We Do? My Daughter is Being Bullied. What Can We Do? A viewer’s daughter is being bullied at school. Although she has confided with the teachers, the bullying continues. Is there anything the parents can do? Attorneys Ed Ciarimboli and Harry McGrath Jr. have the answer. Dave Kuharchik: The scenario today is about bullying at school for this edition of “The Law & You.” Joining us tonight, attorneys Harry McGrath, who’s here for Greg, and Ed Ciarimboli. Thanks for being here. Ed Ciarimboli: Look, somebody’s bullying you at school, call us. We’ll send Harry McGrath right there, he’ll take care of it. Dave: No one messes with him. Ed: Nobody messes with Harry. Dave: Here’s our question tonight. We’ll get you the details on this scenario. Amanda in Kingston says, “My daughter is being bullied at school. She has confided in her teachers but the bullying has not stopped and I am worried about her. What can we do?” Ed, what can Amanda do to help the scenario. Ed: First and foremost, bullying is disgusting. I mean, it really is. It’s something we take very seriously. We’ve handled a number of bullying cases. There is no reason whatsoever in this day and age that any kid should be bullied. They should be able to go to school and get an education without being bullied. If the school isn’t doing anything about it, then you should sue them immediately. Don’t hesitate on it. Get to an attorney and protect your kid’s rights. That’s it. You have to take these things- you have to take them really seriously. You have to go full force on them because it’s the only way that -sometimes- these bullies will learn -and the school district as well. Ed: Document, document, document. I mean, that’s the best thing you could possibly do for your son or daughter that’s in this situation. One of the other things, Snapchat, social media, a lot of this bullying goes on on these social media sites. If it’s a Snapchat type of thing, take a picture of it so you could have this documented and submit it to the school as well. Dave: Good advice and if you need any advice from our attorneys you could give them a call or check them out online. 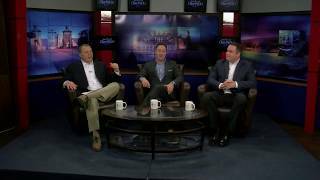 Don’t forget results matter with attorneys Harry McGrath and Ed Ciarimboli. Thank you both for being here.